In this tutorial you will create a mobile app for the image sharing service, Imgur, using NativeScript. I’ll assume this is your first NativeScript app, so will start with the basics. Note: On Linux and Windows you can only deploy to Android. The final code for this tutorial can be found on GitHub. tns create imgurclone --appid "com.yourname.imgurclone"
The tns create command accepts at minimum a single argument and one option. The argument is the name of the app (imgurclone) and the option is the app ID (com.yourname.imgurclone). Next, add the platform you want to deploy to. In this case, Android. Running the tns platform add command will create an android or ios folder under the platforms directory. These directories contains the files to build the app for that specific platform. Now you’re ready to build the app. In NativeScript you mostly work inside the app directory. This contains all the application code translated by NativeScript into the native language of the platform(s). Once you’re finished with the demo app, remove all the files under the app directory except for the App_Resources folder. This folder stores the app icons, splashscreens, sound files and other resources. Breaking this code down. First require the application module. This is one of the core modules provided by NativeScript. These modules provide an abstraction over platform specific implementations. Think of this module as the glue that holds everything together. Note: app.css is empty for this app as there aren’t any common styles I wanted to add. You can of course add your own. main.css: The css file of the page. Note: Each of the files has to have the same name as the folder. NativeScript uses xml files for the UI of the app so there’s more of a learning curve compared to Cordova that uses HTML to build a UI. To find out more about the UI elements provided, read NativeScript’s User Interface Widgets page. Breaking this down. <Page> is the root element and tells NativeScript to create a new page. The loaded attribute runs a function when the page is fully loaded. In this case, the pageLoaded function bound through the main.js file. I will explain the pageLoaded function later. Next is the layout type you want to use, in this case StackLayout. This is just one of the many layouts that you can use. This layout stacks all the components on top of each other, with the first child at the top and the next below etc. The ActivityIndicator displays a spinner to show the app is loading data from the Imgur API in the background. The id attribute will be used as a reference to set other attributes later. The busy attribute accepts a boolean value indicating whether the app is fetching data from the API and a visibility attribute which accepts either visible or collapse as its value. If the busy attribute is true then the value is visible, if it’s false then collapse (hidden). The ListView component, as the name suggests, creates a list. You pass an items attribute whose value is the name of the variable containing the data bound through the main.js file. The itemTap attribute value is the name of the function to execute when an item in the ListView is tapped. This function was also bound through the main.js file. You may have noticed that when binding data you use double curly braces to wrap the name of the variable and when binding a function you just include the name of the function. Inside the ListView is a ListView.itemTemplate that represents each individual item in the ListView. This specific component repeats based on how many items were passed into the ListView. Inside the component use StackLayout again to stack two labels – the name of the topic and the description. Note Double curly braces are used again, but instead of binding data they output data. In NativeScript use the Label component to output text. api is the custom library used to make http requests to the Imgur API. frame is a submodules of the UI module provided by NativeScript. This allows for navigation between different pages of the app. Next, create a variable that will store the current topics. Create the pageLoaded function that executes when the page loads. Earlier in the main.xml file you assigned this function as the value for the loaded attribute of the Page component. Breaking the function down. First access the current page by extracting the object property from the argument passed to the function. This contains the getViewId method used to select components from the page. In this case selecting the spinner and setting its busy attribute to true so that it’s visible and spinning when the page is loaded. Next request all the default topics from the Imgur API using the api library imported earlier. This exposes a get method which allows you to supply a URL to make the request to. It then returns a promise so grab the response data by supplying a function executed once the promise is returned. Inside the function set the spinner to stop, assign the response data to the topics array and then bind it to the current page. At this point the ListView component should now have the data. The openTopic function navigates to the topic page. This value was assigned earlier as the value for the itemTap attribute of the ListView so it’s executed when a user taps an item on the list. The argument passed to this function contains the index of the current item, so use the index value to access the topic ID. Next get the current page and then navigate to the topic page by calling the navigate method. This accepts an object containing the moduleName and the context. The moduleName is the path to the topic page, i.e. views/topic/topic.js. Note: The path isn’t relative to the current file, so you should always start at the root of the app directory. context is an object containing the data you want to pass to the next page. In this case only passing the topic ID. Finally make the pageLoaded function and openTopic function available to the main.xml file by exporting them. This is plain CSS, but note that NativeScript only supports a subset of css. This means that not all css features can be used. For example, you can’t use floats or positioning. Find more information about specific properties supported in the Styling page. The topic page displays random photos under the currently selected topic. Breaking this code down. First you assign a function executed when the page loads. By now you should know that this is a good place to load data needed by the page. Inside the Page is an ActionBar component. This allows you to add a button for navigating back to the main page (main/main.xml). Before moving on to the specifics of the navigation button, note the title attribute of the ActionBar. I specified imgurclone which is the name of the app. This wasn’t necessary earlier in the main page because NativeScript automatically adds a header containing the title of the app. This means that the ActionBar replaces the default header so you need to specify the title yourself. With that done, next is the NavigationButton which is a normal button with no frame. The text attribute is specified but the android.systemIcon is actually used to show the default android system back button. Next is the tap function which executes when a user taps on the button. Next is a StackLayout which contains the button for selecting random items stored by the app, the ActivityIndicator again and a ListView which lists the photos under the selected topic. Inside the ListView display the photo and the title. In NativeScript you display images using the Image component that accepts a src attribute constructed using the ID. Note: m.jpg is used instead of .jpg. The m allows you to specify the size of the image, in this case, medium. This needs to be done because the default url links to the full size image which is too big for a phone. The stretch attribute allows you to specify how the image will be resized based on the height and width specified for the destination (Image component). aspectFit means that the image will be resized to fit the destination while preserving the aspect ratio. The Label component has a new textWrap attribute set to true. This is needed because this attribute is set to false by default. This means that the text will be truncated if it consumes more than one line. Setting it to true allows you to avoid truncation and just show the full text no matter how many lines it consumes. Store the reference to the current page, this is used later to navigate back to the topics page and navigate to the image page. Create the variables for storing the photo data from the Imgur api, the current page and the photos currently displayed. var topic_id = page.navigationContext.id; //get the ID that was passed by the main page. The id is used as a portion of the url to make the request. Inside the function assign the response containing the array of photo data to unfiltered_photos. Then pass that to the getPhotos function whose main purpose is to filter the photos. You’ll see how this works in more detail later. Finally, bind that to the current page. The backToTopics function is used to return to the previous page (main page). 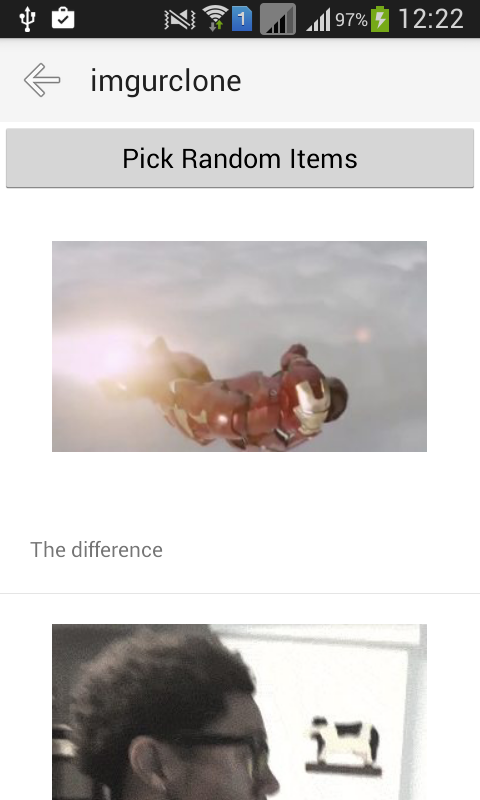 pickRandomItems is called every time a user clicks the button for picking random items from the current photo data. It calls the getPhotos function to get random photo data selected from the current result set and sets it to the current page. The getPhotos function accepts the raw photo data received from the Imgur API and then rejects all items with a type of ‘album’. If you’ve browsed the Imgur website before, you might have seen that there’s a collection of photos called albums. You only want individual photos so exclude those using the reject function in lodash. Then pick a random number used as a starting index for picking the items to show. The viewImage function navigates to the page that shows the photo selected by the user. NativeScript doesn’t support displaying animated (gif) images using the Image component. There’s an open issue on Github about this limitation. If you’re reading this article at a later time it might be solved. For now the current solution is to use a web view that will display the image. Navigate to the page that uses a web view, only passing the url of the image to the next page. Earlier you gave a class of photo to the Image component and this style sets the width and height for the photo. These are the destination dimensios I mentioned earlier. You need to specify the dimensions because it would ruin the layout if not specified. The image page displays the image in a web view and you should know the drill by now (hint: check the previous two app pages). The only difference is that you don’t have to create an image.css file since this page will not need any styling. Breaking the code down. Include the header that contains a button which allows a user to return to the topic page. Next add the WebView component and specify the src to be the url of the image. Create lib/api.js, which is the custom library for making requests to the Imgur API. This uses the fetch function built into NativeScript. It accepts the URL where you want to make the request as its first argument and an object containing the options to pass into the request as its second. Options such as the header, request body, and request method. Making a request to the Imgur API doesn’t require you to create an app on Imgur, I’m showing it for demonstration purposes. Note: The result of the fetch method is a promise and that’s why the api.get call earlier connects to another then method to get the actual data. If you want to test changes you can use the tns livesync command. This refreshes the app in the device every time you hit save. That’s it! In this tutorial you learned how to work with NativeScript, creating an app that talks to the imgur API to get photo data. You used components like image and webview and how to run the app on a device.